Two DNA studies, published this week in the magazines 'Cell' and 'Science', illustrate and considerably complicate human expansion across America. These two studies reveal the existence of several unknown migratory waves and even confirm the existence in Brazil 10,000 years ago of individuals with a genome that would come from Australasia. The first humans arrived from Siberia to America about 25,000 years ago. After millennia isolated in Beringia -region formed by the extreme east of Siberia, the Bering Strait and Alaska-, the retreat of the ice at the end of the last glaciation led to its entry into North America 15,000 years ago. They did so divided into two genetically differentiated populations: one is at the origin of the Clovis culture, which developed in the southern United States and Mexico, and the first humans who arrived in Patagonia; the other was to the northeast and gave rise to the ancient settlers of southern Ontario (see picture). On the North-South model of migratory expansion, "We have identified two unknown migratory waves," says Domingo Carlos Salazar, molecular archaeologist and Ikerbasque researcher at the University of the Basque Country (UPV / EHU), and one of the signatories of the article of 'Cell'. 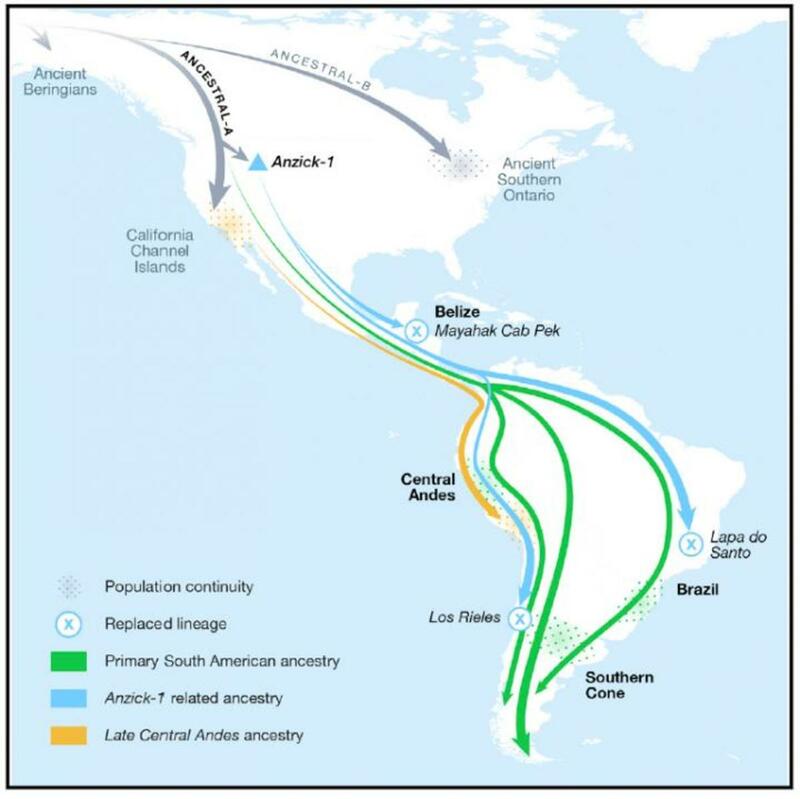 The authors of this work, which have analyzed 49 ancient genomes from Central and South America, have discovered features similar to those of individuals of the Clovis culture in the human genomes of Belize, Chile and Brazil from about 10,000 years ago, which shows that the Clovis culture spread to several places in America. That Clovis lineage, however, no longer exists in South America. "9,000 years ago this lineage disappeared and a new substitution occurred, although we do not know when or what population replaced them," says the UPV / EHU scientist. In addition, ancient DNA reveals that "there was another migratory flow from California that reached the central Andes at least 4,000 years ago." The authors of the 'Science' article have also found evidence of another expansion from Mesoamerica to North America and South America about 8,700 years ago. Slower, this wave did not arrive in Patagonia until about 5,100 years ago and is the one with which most of the current South American human groups are related. "They could have been the ones who wiped out the Clovis in South America," says Antonio Salas, a geneticist at the University of Santiago de Compostela, who stresses how genetics is discovering that "the settlement of America was much more complex than we thought." However, the biggest surprise has been the confirmation by the team of which Salas is part of the existence, 10,000 years ago in Brazil of individuals with genetic traits characteristic of Australasian populations. «How did individuals arrive from Australasia to Brazil? It is the most disruptive. Disrupt all hypotheses. None of us expected something like this, "acknowledges the geneticist, who believes that it is not any kind of pollution or noise. That 'ghost genome', as Salas calls it, is an enigma for future research.